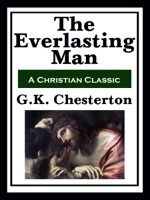 Here is the book that converted C. S. Lewis from atheism to Christianity. This history of mankind, Christ, and Christianity is to some extent a conscious rebuttal of H. G. Wells' Outline of History, which embraced both the evolutionary origins of humanity and the mortal humanity of Jesus. Whereas Orthodoxy detailed Chesterton's own spiritual journey, this book illustrates the spiritual journey of humanity, or at least of Western civilization. A book for both mind and spirit.